The New Pioneer Food Co-op is partnering with Iowa brewers and food producers on a series of locally-flavored collaboration beers. Brewed with ingredients or products sourced from Iowa, the beers are part of New Pioneer’s commitment to connect consumers with local producers — and to fill the store’s shelves with tasty brews, said Melissa Arp, the co-op’s specialties department coordinator. The collaboration series debuted during the summer with the release of Hoppelganger, an IPA brewed by Des Moines’ Madhouse Brewing Company with Iowa-grown hops and malt. Twenty-two-ounce bottles of Rootstock, the series’ second beer, are on shelves now. A Belgian-style field ale brewed by the Backpocket Brewing Company in Coralville, Rootstock was brewed using beets and carrots grown at Grinnell Heritage Farms in Grinnell and butternut squash from Friendly Farms in Iowa City. 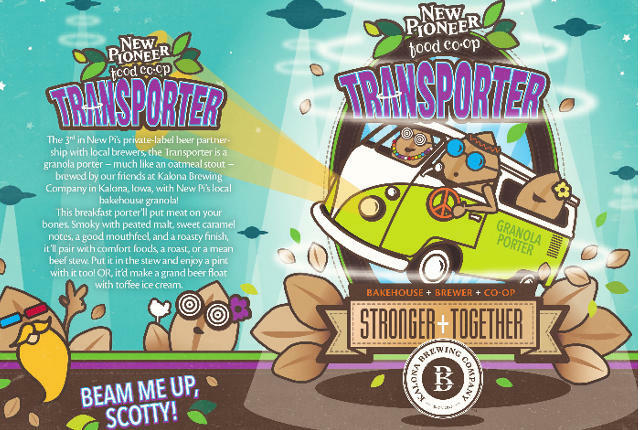 Transporter, a granola porter brewed by the Kalona Brewing Company with New Pioneer’s Bakehouse Granola, will be released on December 4 in four-packs of 16-ounce cans. The series’ fourth beer, Kilt Kicker, is a Scotch ale also brewed by Madhouse. According to Arp, Kilt Kicker is being aged in single-malt whiskey and bourbon barrels, both supplied by Cedar Ridge, and will be released in late-December in 750 ml bottles. A fifth beer, also brewed by Kalona, is being planned for spring 2016. Though Arp said there are no concrete plans for additional brews, the co-op hopes the series will continue and beers will be released quarterly. Depending on their reception, Arp said that beers in this series may return annually as seasonals. With its long-standing commitment to connect local producers to local consumers, and a desire to offer the best and most exciting beers, the collaboration series fits perfectly into New Pioneer’s mission, Arp said. Featured on each beer label is the series’ motto, “Stronger Together,” emphasizing the symbiosis of local ingredients, craftsmanship, and retail. Brewing beer with locally-sourced ingredients can be tricky, said Lew Brewer, head brewer at the Kalona Brewing Company. While major distributors like BSG CraftBrewing, Cargill, and Country Malt offer a plethora of ingredients, there are limitations to local sourcing because some ingredients are not grown locally or are just starting out and have limited harvests at first, as is the case with hops. Sourcing ingredients locally requires a lot of research, Brewer said. Thankfully, New Pioneer has connections with producers across the state, he said, which makes finding ingredients much easier. The co-op even serves as a local producer. Originally, Brewer wanted to brew a Belgian-style beer for the collaboration, but chose not to after learning that Backpocket was brewing a field ale. With local hops and grains unavailable, and Arp asking for a dark beer for the winter months, Brewer suggested using New Pioneer’s Bakehouse Granola to brew a granola porter. Though the oats used in the granola are not local, Arp said it is made at the co-op’s own bakery in North Liberty and uses maple syrup from Great River Maple Syrup in Garnavillo. Brewer said it was both an honor and pleasure collaborating with New Pioneer and is looking forward to brewing the series’ spring beer. Though he declined to offer details, he said it will be a “whole different tone” and will include Iowa-sourced products he was able to procure through the co-op’s statewide connections. Despite limitations for sourcing ingredients locally, Arp said New Pioneer wants to continue the series and continue collaborating with Iowa brewers. She said the co-op is open to collaborating with any Iowa brewery willing to participate in the series. Not all are able, she added, due to production schedules. New Pioneer, she said, is thankful and fortunate that Madhouse, Backpocket, and Kalona were able to participate, giving their time, space, and creativity to collaborate with other local producers and help New Pioneer fulfill its mission to be more than a grocery store. See original article in Little Village.